The NWS is responsible for making weather, water and climate information widely available to taxpayers using commonly accepted standards and technologies. Presently, satellite imagery alone gives mariners at sea an indication of thunderstorm activity beyond the U.S. WSR-88D Weather radar Network coverage. Satellite imagery provides the large scale view but does not provide definitive information concerning whether a particular cloud system is producing lightning. The Lightning Strike Density product is in gridded form (GRIB2). The base data is the Vaisala GLD360 land based detection system. The gridded product is considered a derived product and is therefore acceptable for distribution to the public. The product contains the number of lightning strikes per square meter per second. A lightning flash may comprise of several to many cloud to ground strikes. Graphical images of the gridded product with GOES satellite visible and IR satellite imagery will be available on the Atlantic and Pacific pages of the Ocean Prediction Center web page at http://ocean.weather.gov. The purpose of this product is to enhance awareness of developing and transitory thunderstorm activity, to give users the ability to determine whether a cloud system is producing lightning and if that activity is increasing or decreasing, and to emulate the future GOES-R Global Lightning Mapper (GLM) data. Hazards from thunderstorms include reduced visibility, saturation of collision avoidance radar due attenuation from heavy rain, rapidly increasing and shifting winds, building waves, and lightning. Sailing vessels and small fishing vessels are particularly vulnerable to rapidly degrading conditions associated with thunderstorms, especially those operating beyond the WSR-88D detection volume and cell coverage over the open ocean. Over the past thirty years three large sail training vessels capsized and sank due to high winds from thunderstorms; the Baltimore Clipper Pride of Baltimore 1986, the Barque Marques 1984, and most recently Concordia 2010 off of Brazil. The Pride and Marques sank with 4 and 19 fatalities, respectively. All students and crew survived the Concordia sinking. These products are intended for mariners operating beyond the WSR-88D radar coverage but can be used by anyone with an interest in lightning activity. Mariners are using broadband capabilities as a means of communication and to obtain the latest weather information. Commercial and open source software that are able to request, subset, download, and display meteorological and oceanographic fields in Gridded Binary form have been used by mariners for over twenty years. GRIB files are used across the full range of vessels and operations. 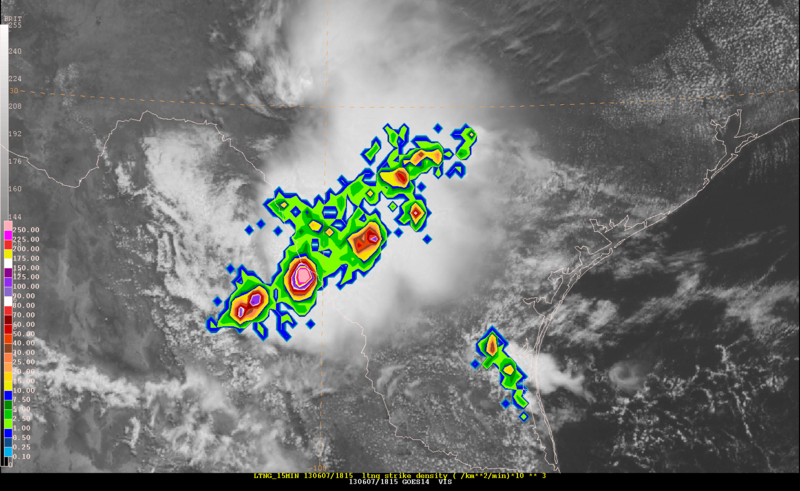 Lightning strike density will be shown as an overlay with GOES visible and infrared imagery. Once downloaded, a software program that can decode and display GRIB2 data will be needed to display the product. The Lightning Strike Density Product is derived from the Vaisala GLD360 global cloud to ground detection network. The Vaisala network is capable of detecting cloud-to-ground strokes, cloud-to-ground flash information and survey level cloud lightning information. According to Vaisala, the GLD360 is capable of a detection efficiency greater than 70% over most of the Northern Hemisphere with a median location accuracy of 5 km or better. The real time data can be available from Vaisala within 60 seconds of acquisition. Files will be generated in GRIB2 format by the Ocean Prediction Center on the NCEP Compute Farm server system and displayed with satellite imagery on the OPC web site. Once generated the product will be transferred to the NCEP RZDM ftp site for availability and then made available via a link from the NWS Ocean Prediction Center website. Graphical images will be generated every 15 minutes using the GEMPAK software and uploaded to the web as soon as generated in gif format. A lightning stroke is defined as, "Parameter that refers to a specific part of a cloud-to-ground lightning flash. A single stroke consists of a downward propagating leader (either a stepped leader or dart leader) plus an upward propagating return stroke. A single CG flash, especially those with negative polarity, may have multiple (return plus subsequent) strokes (up to 20, but mean is three). The strokes of a flash may be separated by more than 5 km from each other." Source is the Functional Requirements Document For the Lightning Data Program (LDP). Lightning Strike Density is the number of lightning strikes over a given time period within a box of fixed horizontal resolution. Per WMO requirement the density is given in SI units of number of lightning strikes per square meter per second (count m-2 s-1). The SI Units required by the WMO for such gridded products will require a scaling factor of 1011 to display in units of strikes km-2 min-1 x s 103. A scaling factor of 103 is needed for the units of count km-2 min-1 to display in integers. The product is written to an 8 x 8 km grid and emulates the resolution of the future Global Lightning Mapper (GLM) instrument to be flown on the GOES-R series of geostationary satellites. The 8 x 8 km grid is coarser than the base data detected by Vaisala. Gridded values will reflect the strike density over 15 and 30 minute collective periods. The gridded product extends from the western South Pacific to north of Scotland. The corner points for the gridded product are: lower left – 25 degrees South latitude, 110 degrees East longitude; upper right – 80 degrees North latitude, 0 degrees longitude. Figure 3. Domain of lightning strike density gridded product in red. The Lightning Strike Density product is based on the Vaisala NLDN and GLD360 data sources. This derived product is a Level 5 product and is appropriate for public distribution. As defined in the Functional Requirements Document For the Lightning Data Program (LDP), Level 5 products are: "NOAA-generated products using lightning data as input but not displaying the contractor transmitted/provided lightning data." Figure 4. 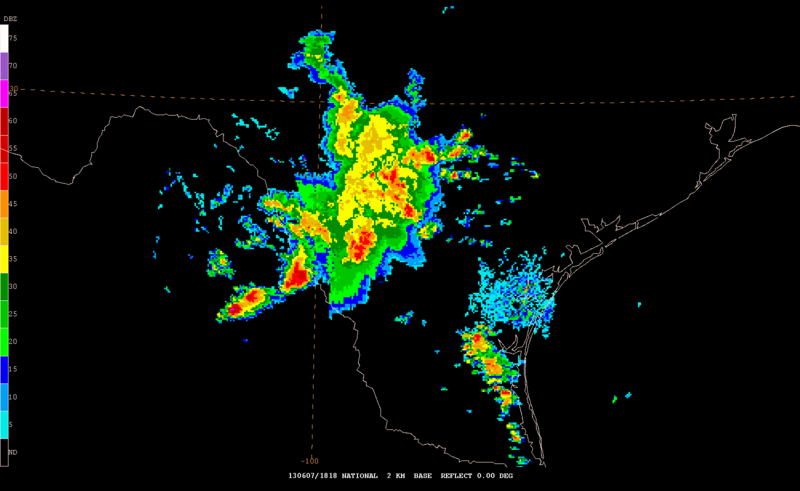 Lightning Strike Density (left) for a cluster of storms over southern Texas with accompanying national radar composite of base reflectivity (right). These products will be available 24 hours a day and 7 days a week.